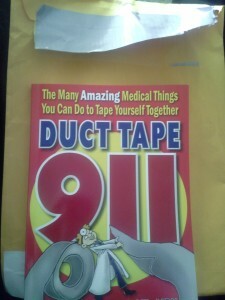 Recently, I received a copy of the book Duct Tape 911: The Many Amazing Things You Can Do to Tape Yourself Together for review. The book was written by James Hubbard, MD, MPH. Hubbard has become known as The Survival Doctor, and in 2011 he launched a website of the same name. The goal of the website is to offer advice on how to deal with medical issues in times when medical help is not available, such as in times of natural disaster, terrorist attacks, or being stuck out in the wilderness. The doctor combines his 30 plus years as a family physician with home remedies to help people stuck in difficult situations. I basically had to read his latest book because it deals with one of my favorite things: duct tape. And the book’s introduction gives a list of why he likes duct tape, which I have to agree with. It’s versatile, strong, easy to tear, easy to shape, sticky, and waterproof. The rest of the book is split into the following sections: Tape Your Joints, Tape Your Skin, Tape Your Eyes, Tape Your Clothes, and Tape Your Life. I mean, who knew that if you lose your glasses, or your lens, you can manage a temporary fix with duct tape. I don’t want to give away anything for you, so I won’t go into any details on any specific procedure, but each of the 23 includes step by step instructions, complete with cute illustrations such as the one on the cover of the book. Due to the small size, this is the perfect book to throw in your backpack on your next camping trip, or keep in your emergency stash, if you have one of those. COMING SOON- An Interview with The Survival Doctor!